Sea Launch's Zenit-3SL vehicle stands erect on the launch pad in this image taken before its failed Jan. 30, 2007 liftoff. 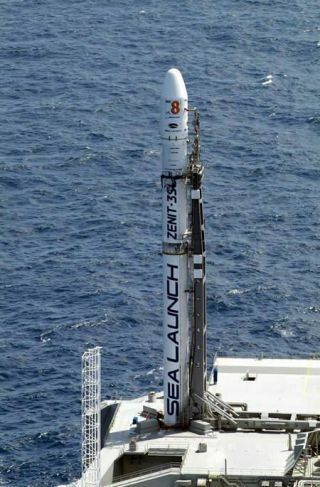 WASHINGTON - The first launch of 2007 by SeaLaunch Company LLC ended in failure when the Zenit 3SL launch vehicle carryingthe SES New Skies NSS-8 telecommunications satellite was destroyed as it waslifting off from the company's mobile launch platform in the Pacific Ocean. Sea Launchissued a brief statement Jan. 30 that the Zenit 3 SL "experienced an anomalytoday during launch operations" and that it was establishing "a Failure ReviewOversight Board to determine the root cause of this anomaly." Sea Launchspokeswoman Paula Korn said in a telephone interview Jan. 30 that the rocketappeared to have exploded as it was lifting off the platform. Korn said no onewas injured in the accident - crew members are not aboard the platform during alaunch -- and that all crew members were safe and accounted for aboard thecommand ship. Korn said a helicopter had been dispatched to the launch platformto make a damage assessment. In a livevideo of the launch, the launch platform appeared to be enveloped in smoke -just as the picture went blank. Sea Launchwas scheduled to conduct a total of six commercial launches in 2007 includingsatellites still to be launched for Echostar, DirecTV, Intelsat, Spaceway and Thuraya. NSS-8 was aKu- and C-band commercial communications satellite that was to have beenlocated at 57 degrees East longitude above the Indian Ocean to provide coverage of Europe, Africa, the Middle East, the Indian sub-continent and Asia, replacing the company's NSS-703 satellite.